Mom's Cast Iron Wok: The Best Wok? My Mom was ahead of the curve by bringing her cast iron wok from Malaysia to Canada all those years ago. Today wok cooking is hot, but choosing a wok isn't easy, even for an Asian girl. I am embarrassed to admit that I don't own a proper wok (yet). I have been stir-frying on Teflon pans or pots for many years now. About a week ago, I decided to toss my 15-year-old pots and pans and purchased a stainless steel set. The only thing missing now is the right wok. I am on a mission to find the best wok for the job. "You can bet that the cast-iron wok used by many Chinese families is preferred." Mom's cast-iron wok comes with a steel wok ring – it distributes heat evenly. She has fried, steamed and boiled all kinds of things in that wok - it is infused with the taste and memory of hundreds of meals. Essentially, use flat-bottom woks for electric stoves. Round ones (including the ring) are great for wok cooking on gas stoves. You can bet that the cast-iron wok used by many Chinese families is preferred. It cooks evenly, quickly and retains heat and is considered the most superior wok of all. The carbon-steel ones are popular because they are light-weight but tend to deform easily while the iron/enamel pairing is considered even better for electric and glass top stoves, helping to impart the heat evenly. The stainless steel ones are a modern invention and considered by many a Chinese cook to be a lesser cousin. It would be harder to achieve the "wok hay" flavour with this material as you'd have to add more oil or water to keep the food from sticking to the pot. Although, if you're an avid steamer of foods, this may be your best bet. 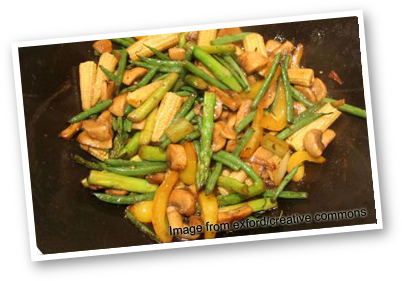 The non-stick varieties are alright for simple frying or sautéing but not appropriate for stir frying. The Chinese stir fry their food at very high temperatures —something not recommended for the non-stick stuff. I asked Tane Chan of The Wok Shop in San Francisco which one sold the most. Carbon steel, flat-bottom, wooden side handle type are number one. Cast iron woks from China, both flat and round bottom were number two. Tane and her late husband Albert started the store, originally a gift shop, in 1968 with wares from China.She says the wok and Chinese food rage started after then-U.S. President Nixon went to China in 1972. "Non Asians were interested in wok cooking [but] woks were only in Chinese grocery stores, which were quite intimidating to Westerners. So, I started carrying woks, and everything to do with cooking." Indeed, her store is stocked with pans, utensils, chinaware, tea accessories and all kinds of baskets for steaming and serving – in the heart of Chinatown.Tane says there's more interest in "authentic" woks here in North America. "There's big interest in cast-iron, natural woks, no more of this non-stick surfaces. The public is now very well aware and are informed as to a wok having to be seasoned and the older and blacker, the better." She says she sells about 10,000 woks every year and people become very attached to their woks. In some cases, the woks last longer than marriages. By the way, Tane's daughter spent a spell in China a few years ago as a Peace Corps volunteer. The Chinese insisted on providing a non-stick wok for her to cook with, insisting that it was higher class and that no person from North America would want to cook like a peasant with the cast iron version. Tane says the Chinese are switching to non-stick while people in the West are opting for the traditional cast-iron.